Trisha Harrington's Blog: Interview with Mia Kerick! I’m so excited today to have Mia Kerick here today for an interview! Thank you for stopping by my blog Mia! Hi Trisha!! I am so glad to be here!! You have been supporting my writing efforts for so long, and I want to thank you for that. Why don’t you start off by telling us a little about Inclination? 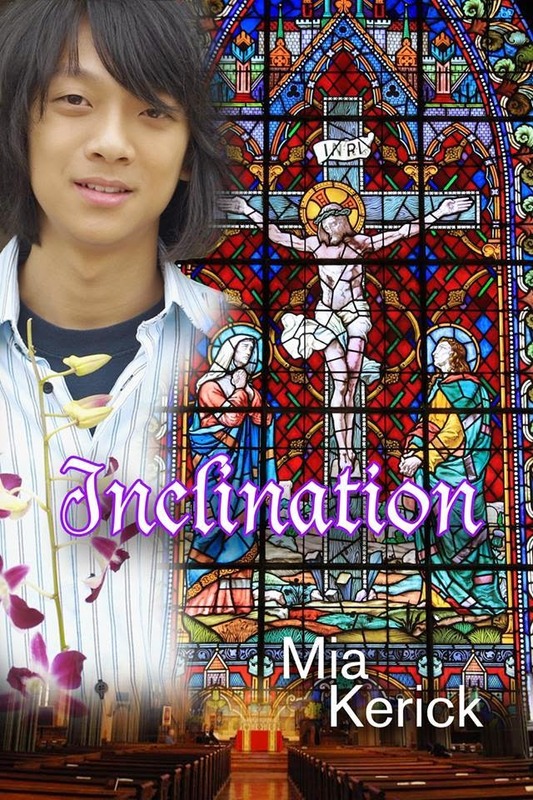 Inclination is a one of my most content-rich novels, and by that I mean that it’s not “just a romance.” In order to accomplish my goal, which was to prove that God loves gay Christians, I needed to do the research and present it fully, hopefully in a way that was user-friendly. Or maybe reader-friendly. But the information had to be there. So, your latest release Inclination is an m/m YA Christian fiction sort of book. What was it like it write and did what inspired you to write it? My inspiration to write Inclination came from several places. First, as I am an LGBT romance writer I believe that romance (if you are one who seeks it) is critical to the well-being of the soul. I realized that two people could be completely compatible and incredibly in love, and due to the teachings of their faiths, could not share a blessed happily ever together. As “Love is What I See” is my slogan, this intolerable realization motivated me to write. It seemed illogical to me that a loving God would set His followers up to live in a situation such as this. I also have personal, what I’ll call, “rule-following” issues with Catholicicsm, as I never could follow all of the rules well enough to feel like I was a “good Catholic”. In my research about LGBT Christianity, I was set free from several of my own hang-ups of what it means to be a person of faith. My excitement that maybe I was, after all, a good Christian, extended into my hope that other people could also feel this way, if I brought my newly found beliefs to light. Was writing Anthony’s struggle with his sexual orientation while wanting to stay true to God and his Catholic faith a hard thing to do as someone who is also Catholic? Or did that make it easier? I used the Catholicism as the backdrop for Anthony’s crisis because, being Catholic, I am most familiar with this religion. However, I just as easily could have used Protestantism, or many other world religions, as the basis of my story. The research would have been different to some extent, but I belive that very often the nature of the conclusion would be the same, in terms of following the spirit of a religion rather than “the rules” that have long been interpreted by human beings. And I never bashed Catholicism. I simply stated the Chrurch’s laws in regard to homosexual behavior as they currently exist, and wrote a story of how Anthony Del Vecchio had to deal with it. In addition, the research I did to write Inclination actually made my faith stronger, as I was cured of my worry that God would act arbitrarily. He is not an arbitrary God. There are reasons and purposes to His expectations of us. Personally, I know I connected with Anthony and his struggles with the religion vs. sexuality (or in my case, beliefs). Did you face a similar struggle? I wrote some of his struggles, for example the compulsive need to go to confession, from my own personal struggles. Also, shades of Anthony’s sexuality struggles were taken from personal experience. So there is a lot of Mia Kerick in Anthony. Although the details of our specific concerns are different, the nature of them are the same. Of course I love Anthony, as he is a little bit me and he is the main charactter, but I will say I tend to be more in love with David Gandy, Anthony’s love interest. I like that his exteriror is cold and sarcastic and a little intimidating, but that the interior of his heart and soul is soft and tender and vulnerable and filled with hope. Do you have a playlist for Inclination? The list of songs that go with Inclination is pretty much endless, but here are some of the primary ones that were in my head as I wrote. Tell us a bit about your writing process! Do you listen to music while you write or do you need complete silence? Do you have a certain place you prefer to write? My favorite place to write, and where I am sitting right now, in fact, is on the couch in my Red Sox room, a family room that is dedicated to the Boston Red Sox. I have written thirteen or so books, mainly on this couch. A disturbing fact: we are replacing the couch with a very plush and soft sectional. I hope this change in seating doesn’t affect my writing, but my current couch has seen many better days. It has to go. And music is very important to the inspirational aspect of my writing, more than an actual requirement for my daily writing. In terms of the writing process, itself, I have a general story in my head and a pretty good idea of the two main characters when I start writing. I then write about three chapters, and I sort out the way the characters speak, their attitudes, their way of interacting, and then I stop for a while. During this time I find images of them online, as I really need visuals of the characters in order to write about them. I call the time during which I do not write, “letting my ideas percolate”. Before I dive back into writing, I develop a general and messy outline just filled with ideas in chronological order. No Roman numerals involved. And after the percolation is finished, I get back to the job of writing. However, my “best laid” (I know, messily laid) plans are subject to change if the characters seem to be taking the story in a different direction. I am writing a YA Gay Romance/Fiction about a gay teenager’s struggle with substance abuse. I always reply to readers who connect with me via email at miakerick@gmail.com. I love to hear from readers who feel that my stories have made a difference to them. Again, thank you so much for stopping by. It’s been great having you here. Thank you, Trisha, for having me today!! Thank you for the thoughtful questions. Great interview and thank you for hosting me today! !